The AVAO BOD FAST fall arrest, work positioning and suspension harness is designed for greater comfort in all situations. Wide, semi-rigid waistbelt and leg loops give excellent support. Its lightweight, breathable construction maximizes air flow. The shoulder straps have a system for stowing the fall arrest lanyard connectors and keeping them within reach. The DOUBLEBACK self-locking buckles at the rear of the harness, between the waistbelt and the leg loops, allow for a shorter adjustment when the dorsal attachment point is used. 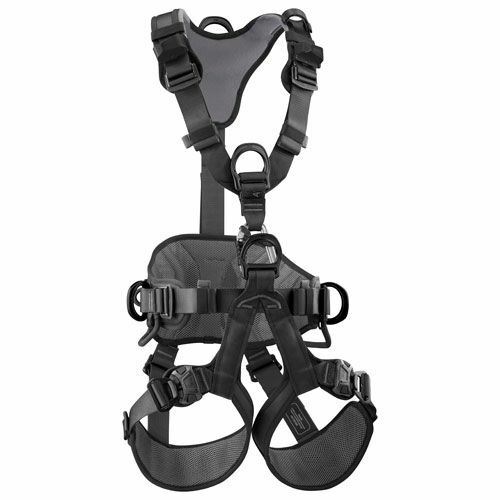 The harness also facilitates the carrying and organizing of work tools, with multiple equipment loops and retainers for attaching CARITOOL tool holders and TOOLBAG tool-holder pouches. The harness has an integrated fall indicator on the dorsal attachment point and is fastened with a TRIACT-LOCK automatic locking carabiner. It is certified to North American and European standards. AVAO BOD FAST features leg loops with FAST automatic buckles.